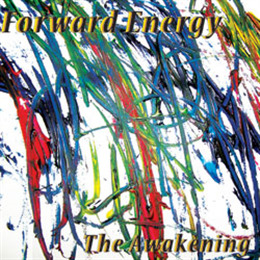 The current formation of Forward represented on “The Awakening” has played monthly throughout 2011 in various venues. It includes founder Jim Ryan (who played on Steve Lacy’s weekly jam sessions in Paris during the early 70’s) on flute, saxes, and trumpet, and original member Scott R. Looney on piano. Scott received his BA in music from Coe College, Iowa and an MFA from Cal Arts. He has been a pillar of the experimental music community since the late 90’s. The group also includes Rent Romus on alto, soprano, and c-melody saxophones. He studied with Stan Getz and is a power both on his horn and as an organizer and promoter of the Bay Area experimental music community. Eric Marshall is a regular bassist with Eddie Gale’s groups and he works in all genres of the jazz idiom. Percussionist Timothy Orr studied with Ed Blackwell and plays all styles from zydeco to free jazz. "Cognizant of more than the Free Jazz tradition, the Forward Energy five tweak the concept enough to prove that unbridled improvising remains a viable musical option." "Polytonal in scope, the quintet embeds ever-so-slight modern mainstream elements into a largely zestful session, spanning free-zone type introspective outlooks with hard and fast dialogues." "...sounds fully improvisational, with lots of sudden variations in the energy and volume level. Stays way out." "Mostly, there’s an attention to creating cohesive pieces. “Talk Talk” includes a chirpy dialogue between the saxes, over nothing but a brisk walking bassline — a nice span, and it sounds great when the rest of the band jumps in at once."